An object in motion stays in motion. But how do we go from the state of not-writing to writing? How do we build up the momentum to just start? 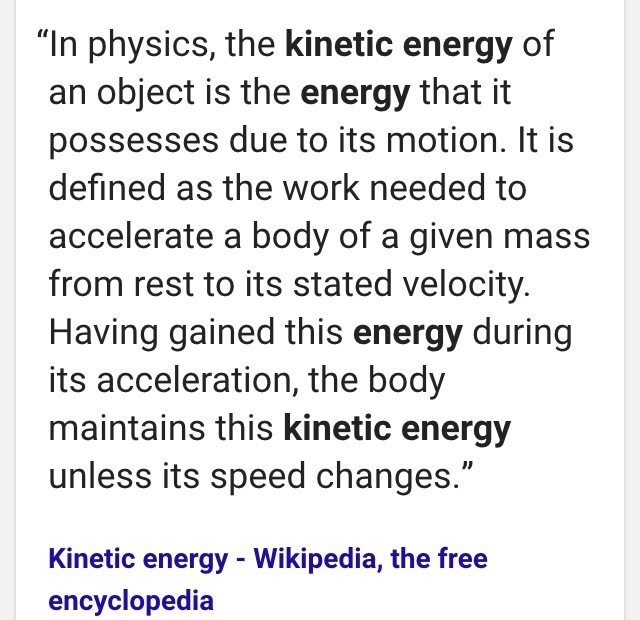 Kinetic energy is the work needed to get something from a rest state to movement. In the process of acceleration, it gains energy that it will retain until the speed changes. Let’s apply this to writing. Sometimes we take a break from writing. Slack off. Burn out. Get busy. Whatever it is, and whatever the reasoning, the result is the same: we get out of the habit of writing. Side note: I hear people throw around the words procrastination and laziness, but let’s leave those aside for now. Procrastination is fear, and the people who tell me they’re lazy are usually doing ten million other things. You’re not lazy – you’re tired. And it’s okay to be tired. Whatever your process entails, once you’re in a state of rest (not-writing), some sort of force needs to be exerted to get you moving again (writing). Sometimes it’s a flash of inspiration, but we can’t rely on something so capricious. Sometimes there are “mental gymnastics” involved (a term I first heard from author Kiersten Krum) in psyching ourselves up to sit down at the computer or notebook to get out the words. Sometimes we need to be in a group of writers, or alone, or with a prompt, or a blank page. And sometimes, we need to shut off all of that, recognize that this isn’t brain surgery, and just sit down and write. This is called willpower, and we all have it. If you want to write and you’ve ever written any words at all toward your stories, you have it. It doesn’t take a lot to get moving, and it’s okay to move slowly at first. But know what helps you accelerate and keep it handy. Start with a sentence. A paragraph. 500 words. Whatever it is you initially aim for, keep it small so you can feel satisfied checking off the goals. Writing stories gives us the freedom to use our imaginations, to create worlds and characters that elicit genuine emotion from readers. And the best part? Whatever words you first put down on the page aren’t set in stone. You can change them, edit them, get help to make them better. Don’t be so precious with it. Just get the words down. Fear will always throw obstacles in your way. The more you grow and expand your skill set, the more fear and resistance will throw new and different roadblocks into your path. It’s okay. It’s part of the growth process. But just because fear is there, doesn’t mean we have to listen to it. If you’re not moving (not writing), find that thing/thought/feeling that gets you going. It’s the key to the ignition. Even if your car is creeping along at 5mph, you’ll eventually reach your destination. Even if you’re writing 500 words per day, you’ll eventually reach “The End.” And chances are, once you get moving, you’ll speed up. But if you’re not moving, you’ll never get there. Potential energy is just that – potential. Kinetic energy is what will get you there, and you’re more than capable of accessing it. How do you bypass the hurdles that stop you from writing? How do you get out of your own way so the words can flow? are you ok? you seem to have fallen behind.